Archos unveils the Gamepad 2, the second generation of its delivered Android 4.2 (Jelly Bean) handheld. Featuring an IPS screen and a better finish, it sold starting at 242 dollars. Last year Archos unveiled the gamepad, a 7-inch tablet acting game console and with buttons and directional cross like that found on a PSP or DS, all running Android. While on paper the idea was good, the execution was fishing, mainly because of a low-end TN display. For the second generation, the manufacturer of Igny reviewing its bug in depth and adopts an IPS touchscreen, which should allow for better ease of use, thanks to angles larger vision. The definition is also higher as we move from 1024 x 600 pixels 1280 x 800 pixels. Inside, there is a Rockchip RK3188 chip, the same team that Platinum tablets announced last week. It has four Cortex-A9 1.6GHz and a Mali 400MP GPU. We may regret the graphical part of the chip, as it begins to date and the latest solutions, especially in PowerVR or Qualcomm, offer slightly better graphics. Anyway, there are 2 GB of RAM and 8 or 16 GB of storage (depending on model), which will be accompanied by a microSDHC card reader (up to an additional 64 GB). Archos had the good idea of ​​integrating App2SD application within the console that will install the games directly on the microSD card. So remember to take one with high flow rates. Connectivity side, it has the right to Bluetooth (unspecified standard) and Wi-Fi 802.11n (Dual band) Miracast compatible, which is, again, a good idea for those with a housing or compatible TV. Indeed, it should avoid using the micro HDMI output of the console to play on the big screen. It is Android 4.2 (Jelly Bean) which is responsible for leading the beast. Archos has installed the GameZone there an application acting booth for games dedicated to this Gamepad 2, as can be the Tegra Zone on the shelves NVIDIA. Remains whether or not there will be many to be optimized for this console. The manufacturer also supplies a software tool to leverage triggers, sticks and buttons for those who do not bear natively. No information is provided regarding autonomy, the manufacturer merely indicates that it has a "50% greater than that normally used on a shelf" battery. A very thin and therefore it will be necessary to wait for the first returns for more argument. Still, its dimensions are 200.5 x 154 x 9.9 mm and weighs 400 grams, which seems a bit heavy, but to do what it can to practice. 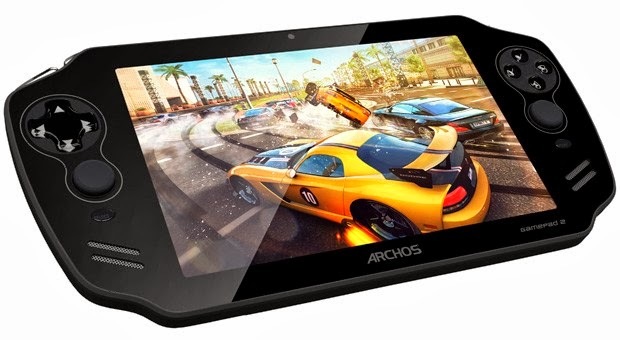 Archos announces that this tablet will be available from the end of the month from 242 dollars in version 8 GB Two sets are provided: Asphalt 8 Airborne and Modern Combat 4, two titles at Gameloft. By cons, no price is given for the 16GB model.